Hamed Mehrabi successful defended his PhD dissertation on April 4, 2017. 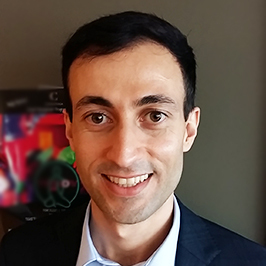 Hamed's research focuses on the impact of institutional pressures and entrepreneurial orientation on marketing capabilities, and the performance consequences of these relationships. His committee comprises Professor Nicole Coviello (Advisor), Associate Professor Chatura Ranaweera and Associate Professor Sofy Caryannopoulos. Hamed's external examiner was Professor Narongsak Thongpapanl from Brock University and the internal examiner was Associate Professor Bill Morrison (Economics). The examination committee was chaired by Professor Anne Wilson (Psychology). Hamed holds an MSc (Information Technology Management) from the University of Tehran and a BSc (Industrial Engineering) from the Iran University of Science and Technology. He has published in Industrial Marketing Management and is both an Ontario Trillium Scholarship and SSHRC Doctoral Fellowship winner. He is currently an assistant professor of Marketing at Ryerson University.